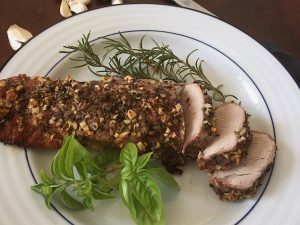 Pork chops are the most popular cut from pork loin. According to its origin, there is a variety of names for pork chops including loin, rib, sirloin and shoulder chops. It is important to note that all pork chops are cooked in the same way. 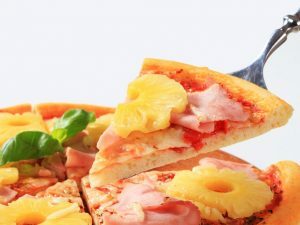 The cooking time, fundamentally, depends on the thickness of the cut, which ranges from 2 to 5 centimeters. 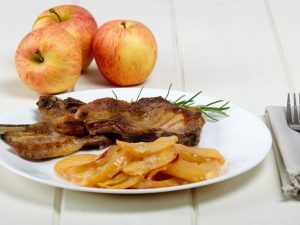 It does not matter if you choose boneless chops for convenience or chops with bone for its attractive appearance – the cooking time will always be the same. Pork chops are probably the least intimidating of all pork cuts because they are always easy to prepare. The San Francisco pork chops are also very easy to prepare, they are grilled with a delicious sauce with sweet touches that are perfect for pork. 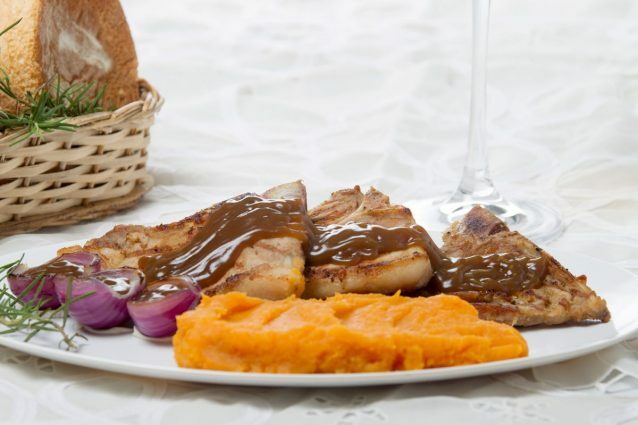 On this occasion, we accompany the pork chops San Francisco style with pure sweet potatoes and roasted onions. Sprinkle the pork chops with lemon and rinse them. If you do not have lemon, just rinse and dry them well with a dish towel. Crush the garlic in a mortar, prepare a paste with crushed garlic, salt, pepper and a tablespoon of olive oil. Season the chops with the mixture. Heat a grill pan over medium-high heat and cook the chops on both sides very well. Reserve. Dissolve the cornstarch in 4 tablespoons of warm water. In a small saucepan over medium low heat mix: melted butter, brown sugar, soy sauce, dissolved cornstarch and chicken broth. Stir very well and add the seasonings: garlic powder and onion powder. Continue stirring until the sauce thickens. Wash the sweet potatoes, peel and cut into small pieces. In a deep pot, boil approximately two liters of water. Cook the sweet potatoes for 15 to 20 minutes until the potatoes are tender. Drain the excess water and crush the potatoes with a fork or a potato crusher. Add the whole milk, honey, sugar and nutmeg powder. Mix until all the ingredients are well integrated. Peel the red onions and cut them in half. Place the olive oil in a hot pan and roast the onions on both sides. Serve the pork chops with the roasted onions and puree of sweet potatoes, cover with several tablespoons of sauce.